Blog Are you a technology-enabled estate agent? Are you a technology-enabled estate agent? The best, modern estate agents are tech-enabled agents. Property professionals have tools like smart phones, apps, email, social media, instant messaging tools and client relationship managers, to name but a few tech tools. Dabbling with these tools does not mean, however, that you are a tech-enabled agent. What is a tech-enabled agent, you ask? Gary Keller, co-founder and Chairman of Keller Williams Realty, distinguishes between the technology-enabled agent and the agent who (unknowingly) enables the technology that aims to eventually replace him. We have written about this before. It's clear that the battles lines have been drawn between estate agents and the technology companies that seek to disrupt the property industry. We've also written about the need for property professionals to own their own business data. There is no neutral side to this. You're either an agent enabling the technology companies to eventually replace you with your business data, or you're an agent using the available technology on your terms. If this sounds a bit dramatic, watch the video below for a great overview of the current trends in the property industry. In the video, Gary Keller explains how many estate agents are unwittingly giving their valuable business data away to technology companies that seek to replace them. With this in mind, Keller Williams has embarked in 2017 on its next evolution – to become a technology company that provides the real estate platform that our agents’ buyers and sellers prefer. Pivoting to a leading real estate technology company, three foundational beliefs guide the tech development at KW: agents should be enabled by their technology, world-class tech companies must own their product road map, and together everyone achieves more. Is this the case in South Africa as well? There is an undeniable technology gap between consumer wants and what the property industry currently provides to agents. In South Africa this is especially true. South African agents have access to the same general tools that our international counterparts have and software found in places like the Apple App Store and Google Play Store. Unfortunately there are also many advanced, custom or bespoke apps and tools that we never get in South Africa. To see an amazing time-saving business tool in the USA, UK or Europe and not being able to access it locally is quite frustrating, to say the least. Well, if you're a Keller Williams associate, this is no longer the case. Keller Williams Southern Africa is invested in closing this gap to give our agents the best technology solutions that will provide the best consumer experiences. To keep our agents ahead of the competition, we are focusing our attention on the future of the industry and where is headed. By creating locally-developed mobile apps, custom lead generation software and business simplification tools, we help KW agents to do what they do best. Selling real estate! 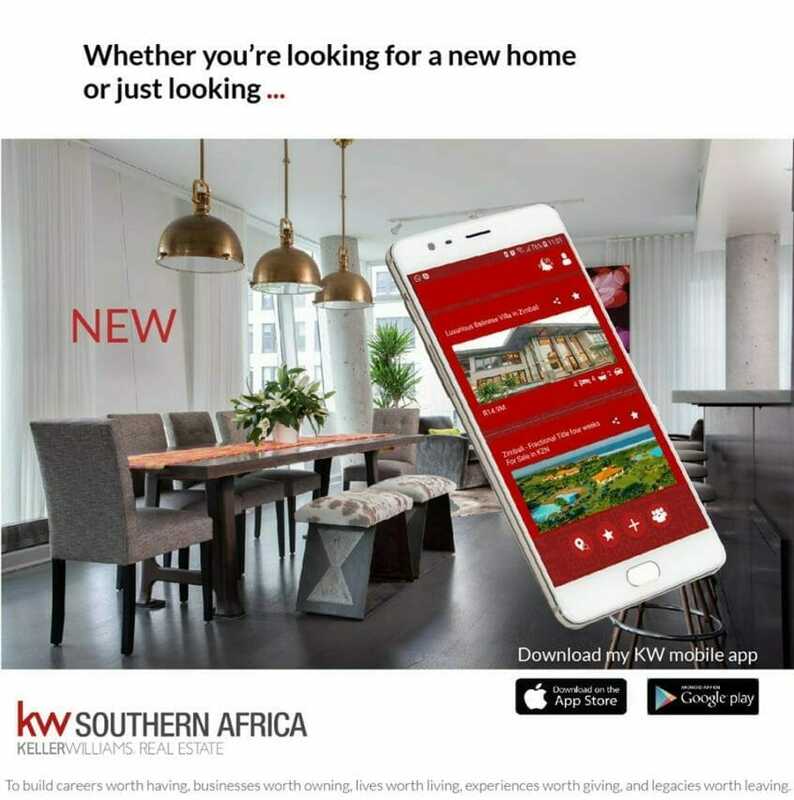 We recently reported that South African Keller Williams estate agents and their clients can now download our brand new MyEdge mobile app. The app is a proudly South African tech tool custom-developed for South African Keller Williams property associates and their clients. The app currently has search, contact, share, listing, communication, client ranking and many other innovative functions with even more to come. It makes the lives of estate agents and their clients much easier. More importantly, it places the agent at the centre of the property transaction to the client's benefit. Click here for more information on the iOS App on the iTunes App Store. Click here for more information on the Google app on the Google Play Store. Last week, a seismic shift occurred in the property world. It was announced that Gary Keller would return as our company's CEO. Josh Team, previously KW's chief innovation officer, was promoted to company president. This further cements KW’s status as a tech company – not a real estate company with a tech department. Their combined leadership creates a tech powerhouse that will forge new paths for Keller Williams and redefine the property industry. To make the most of what KW has developed so far, agents should embrace the change that’s coming so that they can continue to be the experts in their field, and not be left behind. Did you know that Amazon recently opened its first brick-and-mortar store? If this online giant adds physical stores to its business plans, and there are many others doing the same, it’s clear that consumers want an in-store or in-person experience as much as an online one. After all, trust is built and maintained by looking someone in the face, with interpersonal communication, and by knowing what you’re getting when you’ve closed the transaction. Although technology is important, as property professionals we need to help our clients make smart decisions. Nothing can completely replace the human connection and how it feels to relate to someone in the moment. By developing smart technology platforms, we’re empowering our tech-enabled agents to provide enhanced customer experiences. As a technology leader, KW is building tech tools and developing strategies for the future. We anticipate the needs of consumers and the needs of our agents to be relevant in their transactions. It's a continuous process of looking far enough ahead and building the necessary tech tools fast enough. To innovate at a fast pace with our agents and their clients in mind, Keller Williams has instituted Labs. Labs is an in-house program where our agents are invited to build software with our technologists. Agents can dream up innovative solutions to their business challenges while offering immediate feedback to our developers to refine tech products in the pipeline. So, are you enabling tech or are you tech-enabled? With more than 190,000 agents worldwide, Keller Williams have the unique ability to drive this tech revolution. Proudly agent-centric, we aim to put our agents where they belong, in the centre of the transaction. What is your agency doing for you in this regard? Some South African groups have already hedged their bets against the tech onslaught. To get access to the best tech on offer in the property industry, click here to arrange a confidential discussion with our leadership team.